Are You Empathetic as a Leader During Challenging Times? A leader in a large organization told me that she and her team were experiencing malaise and frustration. The organization had a new person at the top with a new vision. This new strategy translated into a different emphasis on their part of the business and they were expected to practically double their outcome without additional resources. To make matters worse, a few key people on the team had recently left the organization. I worked to give the leader empathy first. It was a difficult situation and each person on the team was handling the stress differently. After calming down, the leader realized that she needed to support her team. She decided to gather them together and share with them her own frustration with the system yet her excitement about what they could create. However, she needed to find a way to first regain her own energy and vision to support the team. Once she managed her own fears and frustration through our conversation, she was able to focus on the team. She realized that she needed to give her team members empathy and provide them the space they needed to express their emotions. My client went on to do this. And she helped her team to reconnect to their compelling vision. They aligned on their mission again and this provided them with a renewed vigor. A lot of energy is gained when we recall our vision and purpose. Renewed vigor led to looking for solutions. How could they meet their new goals? How could they ask for more resources or feel comfortable with doing their best and not meeting the unrealistic goals? In this case, they were able to speak and collaborate with another leader and team and receive help toward their goal. My client emerged with new energy herself and the satisfaction of seeing her team mobilize to achieve a compelling vision. A leader must recognize her emotions and calm down in order to support her team in expressing their emotions, which opens the doors of possibilities and solutions. Then it is useful to share and develop together a compelling vision that is motivating and leads to the removal of obstacles and gaining support. It is not easy to be a leader, but it is rewarding. Are you managing yourself, supporting your team by giving them empathy, sharing a compelling vision and solving challenges together? How is it going? 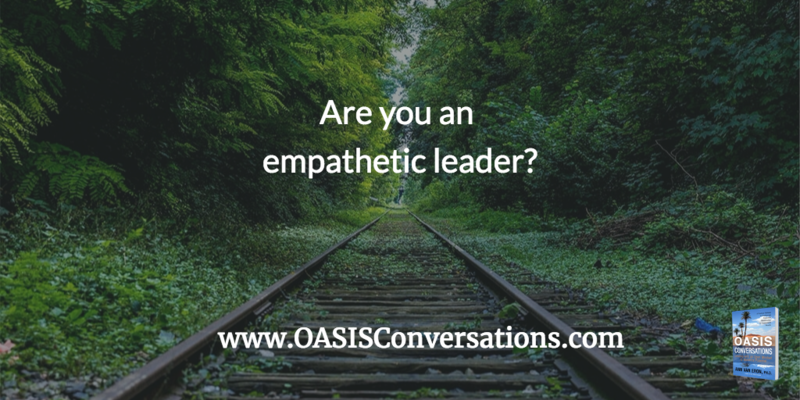 Feel free to contact us to learn more about using the OASIS moves in leadership positions to provide empathy and reinvigorate your team.